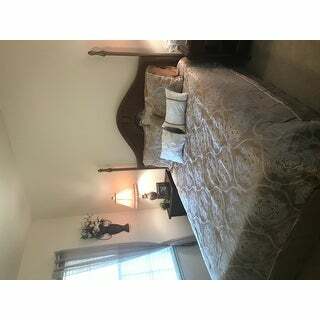 Love this comforter set! It’s just so pleasing to the eye. Quality and fit are perfect. Looks much better in person than in the photo. Stunningly elegant, the Madison Park Waylon 8 Piece Jacquard Comforter Set offers a lavish update to your bedroom. The jacquard woven comforter and shams feature a taupe medallion motif creating a beautiful transitional look. 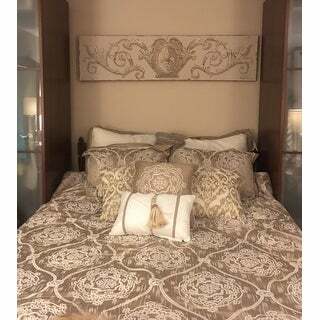 A solid taupe reverse on the comforter and two Euro shams with chic flanges, in coordinating hues, complement the top of the bed. To complete the bedding set decorative pillows with embroidered details and pintuck and pleated design add charm and texture to the top of the bed, while a solid taupe bed skirt provides a clean finish to the ensemble. Overfilled for superior comfort, this jacquard comforter set is machine washable and brings a classy touch to your bedroom decor.